Working with the UKTI Export Sales Team of the Ministry of Defence, Majorlift arranged a photo shoot of their equipment at the Tidworth Garrison. 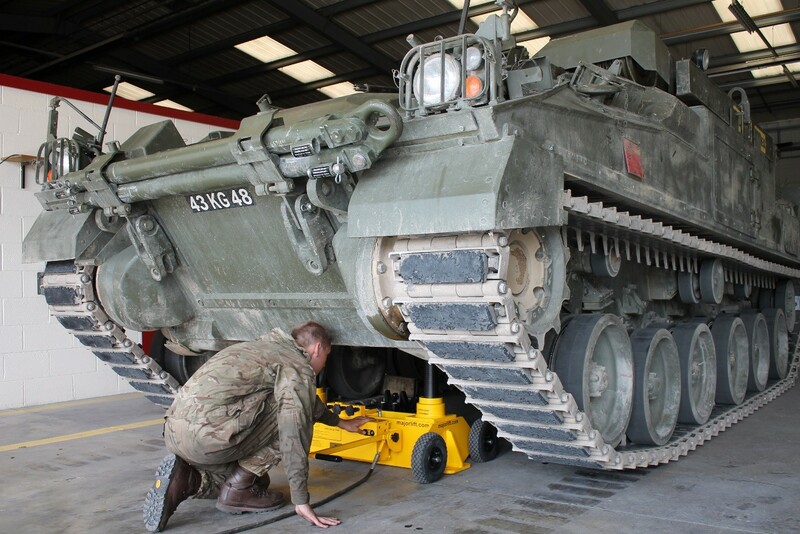 On a visit to agree locations and content, Majorlift’s MD, Tristram Southgate, asked the REME staff if there were any problematic servicing jobs that regularly cropped up. The team took him to see the Warrior armoured vehicle and explained that the worst job that they had was to change the torsion bar on one of the track wheels, three in from the end. Tristram asked how this is achieved at present and they explained that they use a combination of trolley jacks and wooden chocks to lift it in stages to the desired height. Once the Majorlift team had returned to the office they applied their minds to this problem and the result was a proof of concept lifting solution, nicknamed the “Tank Tipper”. Designed to move on pneumatic tyres and with a 20 Tonne lifting capacity, this specially designed lift can be easily positioned under the tracked vehicle and then connected to an air hose – either from the vehicle’s on-board compressor or a workshop supply. A simple button allows the jack to start lifting, at which point the tyres deform so no further movement is possible and the tank can be raised to take the load off the torsion bar. Once the desired lift is achieved, the treaded nut on the ram, a standard safety feature on all Majorlift hydraulic lifts,can be spun down to give a positive, mechanical lock, preventing accidental lowering and protecting the mechanic. Once the work is completed, the nuts can be disengaged and the vehicle lowered, the Tank Tipper can be wheeled out of the way until next time. On the day of the photoshoot, only three weeks after the initial visit, the Majorlift team returned to Tidworth, bringing the prototype Tank Tipper with them. The Tank Tipper was wheeled into place, connected up to the air supply and safely lifted the Warrior; just as predicted. The REME team were suitably impressed, but also surprised at how quickly Majorlift had managed to produce such an effective solution. 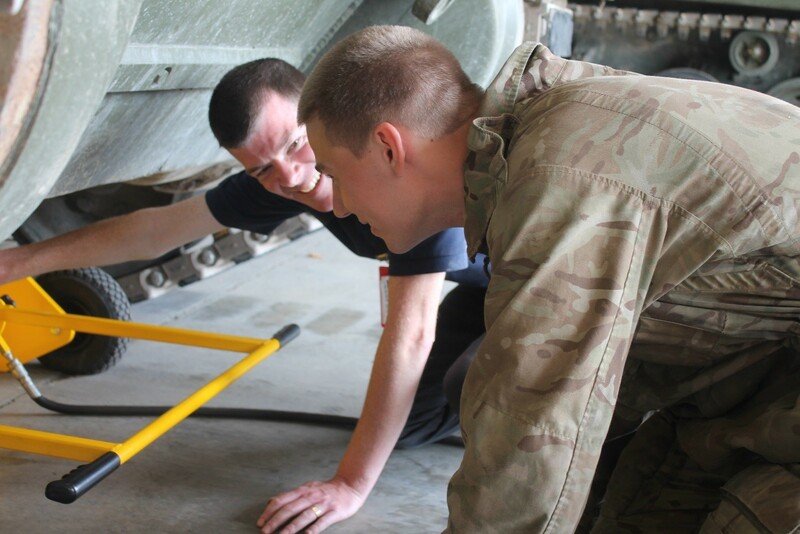 Our picture shows Majorlift’s Sales Manager, Chris Hodder, discussing the operation the Tank Tipper with a REME fitter. Majorlift reach a new standard of Quality.